He's America's most unlikely pop star. 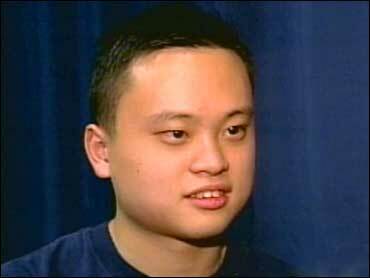 William Hung, an engineering student at the University of California at Berkeley, officially launches a music career Tuesday, when his video premieres on Fuse Music Network. "I get recognized everywhere I go now," he tells The Early Show National Correspondent Hattie Kauffman and notes he is not tired of it. "This is exciting. This is great," he exclaims. William's fan base is growing. It was pandemonium when he performed recently at a San Diego mall the song "She Bangs." One of his fans says, "I wanted to see William hung sing." To her, he doesn't sing terrible, she says. A teenage girl notes, "First time I saw him, I thought he was out of control. Love it." And a teenage boy says, "I just believe in him. How he sings is good." His mom adds, "Even if he can't sing, he's got the moves and there's something about him that just makes you fall in love with him." Asked what it feels like for him to be on stage in front of crowds cheering, Hung says, "I do get nervous inside. I mean, I hide it pretty well, obviously, but I'm nervous. I'm so excited that people are feeding to my energy, or whatever, the charisma." "She Bangs" was originally a Ricky Martin song, but Hung has taken the Latin heartthrob's hit and made it his own, with a big assist from music video director Jeff Richter. It was Richter who figured the aspiring singer could scale to unforeseen heights after seeing Hung on the news. And at Berkeley, Hung was offered a record deal from Koch Entertainment. Richter says, "I called the record company that night, left a message on their machine saying, look I really want to do this video. I hunted down this video." "I think it's his honesty," Richter explains, "You know, there's just something about him. He's the ultimate underdog and I wanted to do something to help him out." Hung also got help from a vocal coach. Asked if he has any words of advice for somebody out there trying to make it in the music business, Hung says, "Oh! it is tough. It requires a lot, like determination, it requires a little bit of luck, I guess." Richter believes Hung's future is promising. "I actually think he's going to have a lot longer career than people are expecting. And you know, if fame is measured in 15 minutes, I think he's only on, like minute two or three," he says. Hung's CD is called "Inspiration." Music executives are hoping "Idol" fans remain hung up on Hung. "I'm happy," Hung says, "I sign so many autographs and take so many pictures with people already." But don't expect him to start hiding behind glasses. "I'm not one of those people," he says. Hung's new album will also feature familiar favorites such as Elton John's "Can You Feel The Love Tonight" and "Rocket Man." And for those who can't get enough, a Fuse music special: "Idol Worship: The William Hung Story" also premieres Tuesday night.